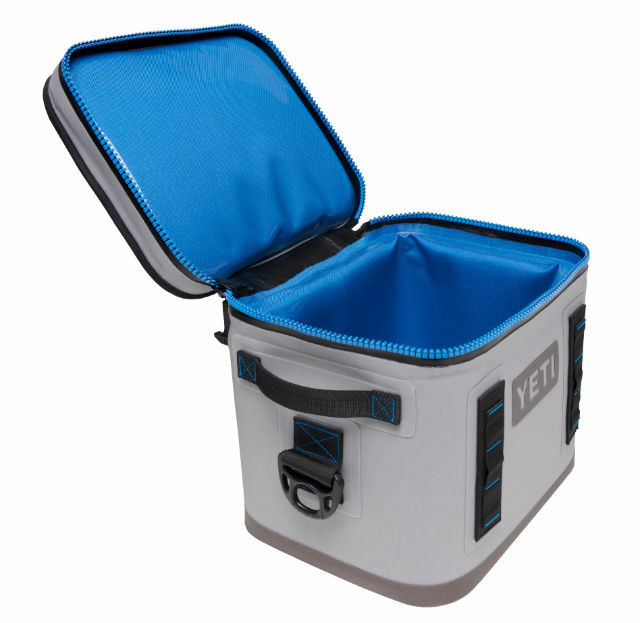 YETI is expanding their family of durable and portable soft coolers. The Hopper family now includes the Hopper Flip — a 100-percent leakproof, tough-as-nails, carry-the-day soft cooler built for adventure. The Hopper Flip retains ice for days and can withstand serious abuse in the field, on the water, or at the campsite. Its compact, cubed design makes for easy hauling while the wide-mouth opening provides greater visibility and access to your food and drinks. The Hopper Flip’s over-engineered construction includes the leakproof HydroLok Zipper, the puncture resistant DryHide Shell, and up to one inch of superior ColdCell Insulation. The heavy-duty EVA foam bottom and RF-welded seams provide waterproof construction and unmatched durability, while the double-stitched handles and included removable shoulder strap offer comfortable, reliable carrying options. The HitchPoint Grid makes the Hopper Flip compatible with the MOLLE Bottle Opener, MOLLE Zinger, as well as our water-resistant SideKick Gear Case, perfect for stashing your keys, wallet, and extra gear. The Hopper Flip will be available in Fog Gray through authorized dealers and on www.YETI.com starting August 25, 2016. Retail price is $279.99.